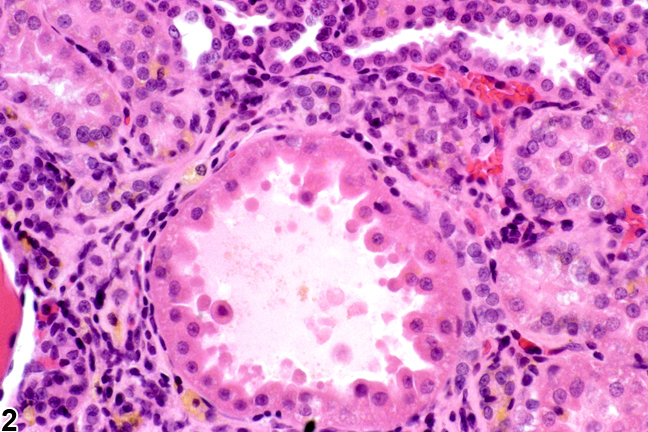 Kidney, Renal tubule - Hypertrophy in a male F344/N rat from a chronic study. 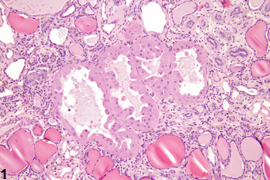 These hypertrophied tubular epithelial cells with an increased amount of amorphous, eosinophilic cytoplasm and small, round, dense nuclei are associated with chronic progressive nephropathy. 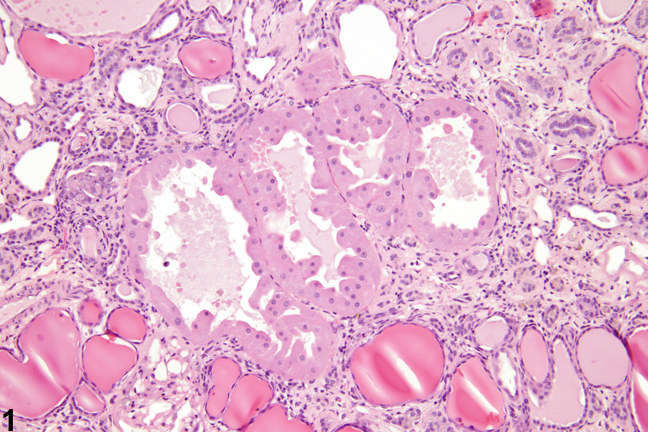 Kidney, Renal tubule - Hypertrophy in a male F344/N rat. This is a slightly higher magnification example of a hypertrophied tubule. Renal tubule hypertrophy is characterized by enlarged tubule epithelial cells that have variable tinctorial staining. Typically, the tubule is lined by a single layer of epithelial cells, and the numbers of epithelial cells are not increased. 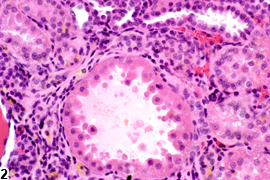 The cytoplasm of hypertrophic cells is usually amorphous and brightly eosinophilic, while nuclei appear small, round and dense ( Figure 1 and Figure 2 ). Tangential sections through renal tubule hypertrophy may be misleading, appearing somewhat hyperplastic. Hypertrophy is often observed in more severe cases of chronic progressive nephropathy (see Kidney - Nephropathy, Chronic Progressive) and is believed to be a compensatory mechanism related to a decline in renal function. It may also result from chemical administration. Hypertrophy should not be regarded as a preneoplastic condition. Renal tubule hypertrophy should be diagnosed and given a severity grade. Hypertrophy as a component of chronic progressive nephropathy should not be diagnosed separately but should be considered a component of chronic progressive nephropathy. Ellison DH, Velazquez H, Wright FS. 1989. Adaptation of the distal tubule of the rat. Structural and functional effects of dietary salt intake and chronic diuretic infusion. J Clin Invest 83:113-126.